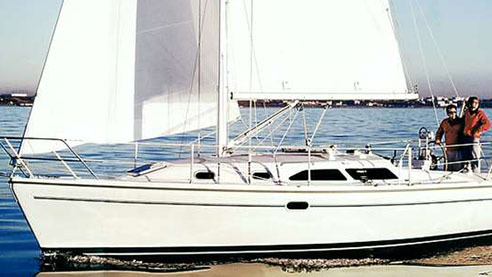 Catalina Yachts is one of the most successful production builders in this country. 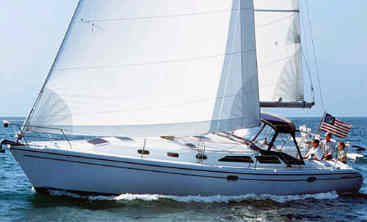 The Catalina 27 has been in production for over 10 years. President Frank Butler and chief designer Gerry Douglas know the production boat business very well. 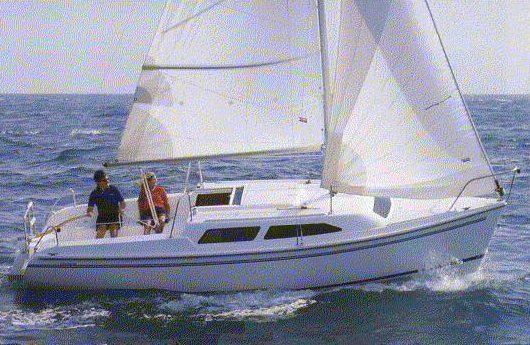 It is not unusual to find Catalina owners who are on their third Catalina product. I have spoken to several Catalina owners' groups and they are always enthusiastic about their boats. The secret to this success in the ability to combine comfort, performance and low price. After extensive market research, Butler and Douglas came up with the new 42. 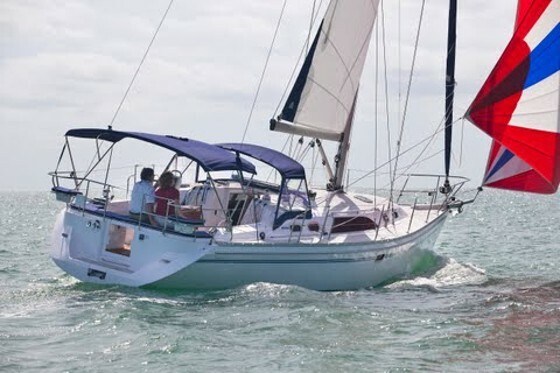 They took the forward end of the Freeport and Passport series boats and combined it with a French back end and connected it with a Californian middle. Three couples can cruise in comfort with reasonable privacy. This is a good looking boat with clean and functional lines. 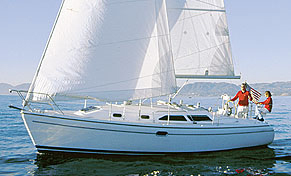 The hull has quite a deep midsection with moderate flare to the topsides. The D/L is 172. The stern has been sculpted to allow a swim platform and aft boarding gate or door in the transom. This is ideal for cruising. 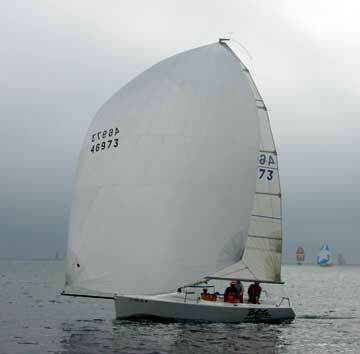 The keel is a straight fin and the rudder is a partially balanced spade. There is plenty of beam at 13 feet 10 inches and this is carried aft to a broad transom. The bulk of the transom seems to be diminished by the step and gate detailing. 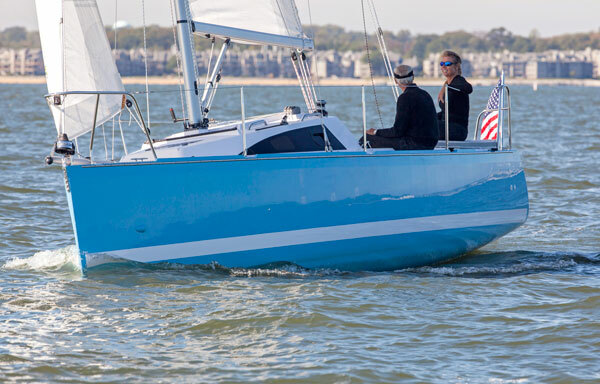 The Catalina 42 is rigged as a sloop with slightly swept-back spreaders and single lower shrouds. The backstay is slightly off center to allow free access to the boarding gate, presumably. The boat comes with a fully battened main and lazy main system of lazyjacks by North. The solid boom vang is also standard. The SA/D ratio is 18.56. I like the crisp lines of this deck and cabintrunk. The cockpit is spacious with ramp type coamings. The raised helm seat removes for clear access to the transom gate. A hand-held shower is located on the swim step, recessed beneath a teak step. There is a large anchor locker in the foredeck. I try to restrict my comments to the drawings of the boats I review. Every once in awhile I get some photos. In some cases the photos prove that the designer was optimistic in his aesthetic decisions and the actual boat is not a thing of beauty. In other cases the drawings may be ordinary or even plain bad and the photos show the boat to be quite handsome. In this case the drawings are well done and the photos show the boat to be even better looking. The hull has an attractive line to it and the way the quarter wave just kisses the edge of the transom indicates to me that this design will sail nicely and make full use of its potential sailing length. The interior is finished in solid teak trim with teak veneers. This is without a doubt the most luxurious Catalina ever built. 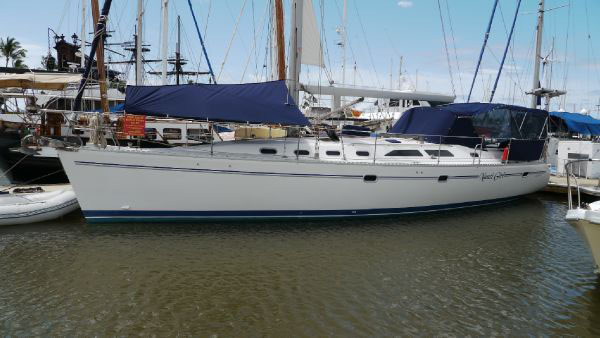 With over 50 boats sold in its initial six months, I think we can assume that this will be another successful Catalina.